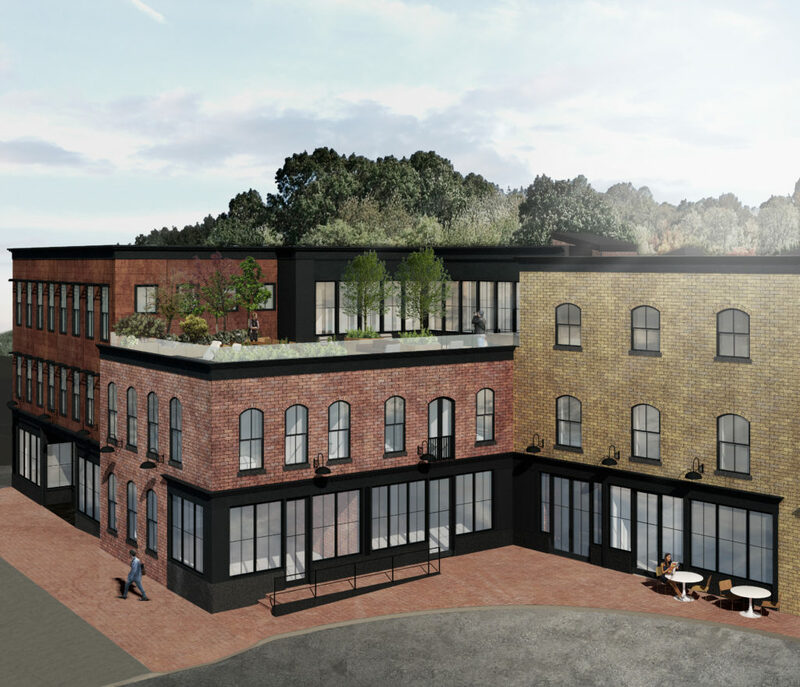 The latest exterior rendering of 47 Railroad by New York City-based architecture and design firm INC shows adherence to the town's industrial mood with brick and corden steel details. The complex at the top of Railroad Street will feature 12 high design, high efficiency rental apartments, and five commercial storefront spaces. Framework developers plan to open up the alley as a pedestrian corridor to Castle Street. Rendering courtesy of Framework. Great Barrington — Plans for a new complex of sleek apartments and commercial space at the top of Railroad Street got a green light last night after the Selectboard Monday (October17), in a unanimous vote, issued Framework, formerly Benchmark Properties, its special permit. Local and New York-based development team Ian Rasch and Sam Nickerson plan 12 market-rate rental units, a garden deck on the roof, and five commercial storefront spaces in their building, 47 Railroad is best known for a string of restaurant tenants beginning with Pearl’s. An old building in the back will be demolished and a new, larger one put up to expand the existing footprint. Rasch and Nickerson specialize in adaptive reuse of historic buildings, using high-level design and energy efficiency. At 47 Railroad they also plan to open up the alley wall for retail spaces, creating a more vibrant walk-through that leads to Castle Street. “A new pedestrian corridor,” Rasch said. Rasch had previously told The Edge he and Nickerson planned to curate the retail aspect at 47 Railroad by only bringing in tenants — and possibly a wine bar or coffee shop — that will enliven the development and complement that part of town. Project engineer Jim Scalise from Pittsfield-based SK Design Group said the project had not met with resistance from any town boards, and that all other permits were in place. A rendering of the lobby of 47 Railroad. A rendering of the kitchen in a rental unit at 47 Railroad. At the meeting, Framework architect Michael Valenti of SK Design rolled out the renderings. “We’re trying to keep the rhythm and historical value, but in a new and innovative way,” he said. Valenti said the buildings will keep to the industrial period look with brick and corten steel, which rusts only up to a point over the period of about a year. And those shutters everyone thought were part of the original building design are coming off. As it turns out, Rasch researched it. The shutters were put up in 2001. Rasch says work to the alley and the back of the building will be inconvenient, but will improve conditions there. But some abutters are concerned about access during construction. “Crystal Essence is worried,” Rasch said. “But it’s all up to the building inspector,” who, Rasch added, may have to cut off access for public safety. The only sticky point was the 11 parking spaces required by zoning regulations to accommodate the storefronts. Framework got a long-term lease for 12 spaces between Barrington House and Triplex Cinema, but Selectboard Chair Sean Stanton thought displacing those who already use those spaces was a bad idea. Stanton thought the parking requirement should be waived as part of the permit, and in the end, that’s what happened. Scalise said he was concerned about it, too. “To revitalize downtowns you’re always going to run into that issue,” he said. But in the end, the town and developers agreed to enter into an agreement for a larger downtown parking solution that may, with a bit of artful legal work, end up on the empty lot across the railroad tracks. Board member Steve Bannon said these parking issues were not a bad thing. “If we have a parking problem, then we have a healthy downtown,” he said. Looks like a great project for railroad street! Is there any attempt to meet the needs of those who aren’t looking to shop in upscale establishments? There is not anywhere in GB to purchase children’s clothing – nor adult clothing at reasonable prices that average working people can afford. The celebratory tone around ‘property values go up’ speaks volumes to the goals of projects like this. Property owners may gain, but tenants, local families, those trying to start small businesses, and the average folks in general will continue to be driven away. I do congratulate these developers and hope for their success. But it seems that anyone who may have been considering opening an affordable clothing store, for example, will find lease rates ever more out of reach. I hope these developers will consider some affordable establishments as part of their curtain efforts, and will make it financially feasible for local, working and middle class families to participate in the resurgence of this beautiful site. How about the new Goodwill next to Mavis? That helps, but, being a Goodwill, donation-based store, it’s always going to be hit or miss. When you need clothing for a child, you can’t assume you’ll find something to meet your needs. To be clear, I’m not suggesting that these developers have any obligation to consider the health of the community, particularly in regard to economic diversity. I am just pointing out that it will be ever-more difficult for a small business to thrive here, given the increasing costs of real estate purchases and leases. High end will always win, but as a community it would be worthwhile to consider the implications of this trend, and to determine whether there’s a way to allow for ‘development’ at both ends of the cost spectrum. Not sure why you, “B”, feel the need to anonymous, or why The Edge permits it. I find anonymity encourages a lack of civility. “Andrew” is nearly as anonymous as “B”, isn’t it? Cathy and B have a point. While I also congratulate the developers on bringing more desperately needed housing to the town center and developing a vacant building, I implore them to consider ‘market rate’ not just the highest possible price. I urge the developers to think about the amount of coffee shops and boutique food destinations we already have right in downtown. What about different kinds of businesses for these commercial spaces? What about something that didn’t expand the already saturated service and specialty industry but brought interesting, well-paying jobs? As a young person who grew up here and has chosen to return, I want to see this community thrive. When hardworking people can’t afford to live anywhere near the town center, that’s a problem. There has to be some middle ground. There has to be something between subsidized affordable housing and $1500 a month for rent. As Cathy says, average people can’t afford to buy clothes on Main St. or Railroad St., and that is also a problem. I completely support thoughtful development to keep our downtown vibrant. That development, however, has to consider the people who live here all year, as well as the visitors who contribute to our economy. Actually what makes Great Barrington so vital and interesting is the year round residents, and all that they do. I agree with you. Such a shame that no one is really addressing quality housing that is affordable, as well as some practical businesses that provide affordable, well made, and functional products and necessities. Because we need more Highend housing????? I’m sure! Another step closer to becoming …..Newer Upper Soho !